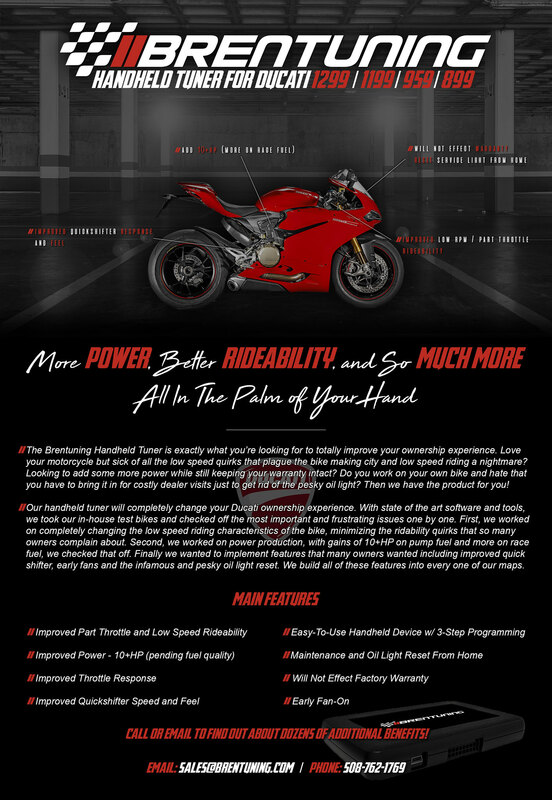 Had some free time so messed around with photoshop to creat a quick one page flyer to answer some of the most frequently asked questions about our Ducati Tuning Solution for the 899/959/1199/1299. Most of this will pertain to the 848/1048 bikes as well! Our handheld is available through our webstore - brentuningmoto.com/shop with full product details and information. Use promo code DUCFORUM at checkout for exclusive discounted pricing for Ducati Forum members. Are you developing a handheld tuning for the V4? Use promo code DUCFORUM at checkout for $100 off.